My series preview and prediction have already been posted, meaning it’s now time to take a closer look at the Blackhawks and what they need to do to bring home Lord Stanley for a third time in six years. The Hawks are coming off of what many are calling one of their toughest series in the Toews-Kane era. 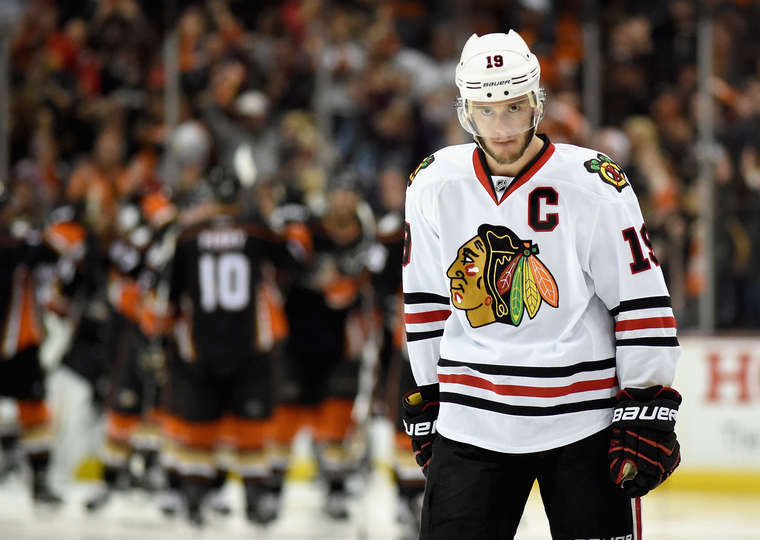 The Ducks were arguably the deepest team that the Blackhawks have faced in a seven game series in recent years, as well as one of the biggest. Anaheim, or more specifically Ryan Kesler, was sure that there was no way any human being could withstand the physical pounding induced by the Ducks and still win the series. Well, that may be true because the Blackhawks aren’t really humans. They are more along the lines of indestructible machines that don’t seem to care what style of hockey you play. They’ll simply adjust and still find a way to win. Over the course of the Western Conference Final, we saw what kind of team the Blackhawks truly are this year. Not to take anything away from Nashville or Minnesota, but neither team really pushed the Hawks to their limit in nearly each game of the series like the Ducks just did. In beating Anaheim, we learned/rediscovered the fact that this group of Blackhawks players never backs down when faced with adversity and has too much experience, leadership, and heart to lose. We also learned that this Hawks team is the deepest team in the NHL at the forward position; a huge reason for their victory over the Ducks. Duncan Keith, as if trying to remind us all of his superhuman abilities, logged more minutes against Anaheim than in any previous playoff series he had played, yet only seemed to get stronger as the series prolonged. If the playoffs ended today, he’d be a top three candidate for the Conn Smythe Trophy as the playoff MVP. Four-line production. I’ve said it a couple times already, and I’ll say it again. The Blackhawks need to keep getting production from all four lines. Their bottom two lines are what kept them alive in the WCF before Toews and Kane were reunited on the top line and took over the show. Assuming the lines from Game 7 stick heading into Game 1 with Tampa, it would be safe to think the Hawks’ top line will continue producing, and possibly at an even higher rate than they already have been due to there being no more Ryan Kesler on the other side. The second line of Bickell, Richards, and Hossa looked pretty solid in Game 7 (despite Bickell sitting with an injury most of the night), and this line could be a key to victory for the Hawks in this series. With Hossa starting to get hot and Richards looking more and more like his old self, rolling two formidable lines could be huge against Tampa. The third and fourth lines of the Hawks just need to keep doing what they’ve been doing. 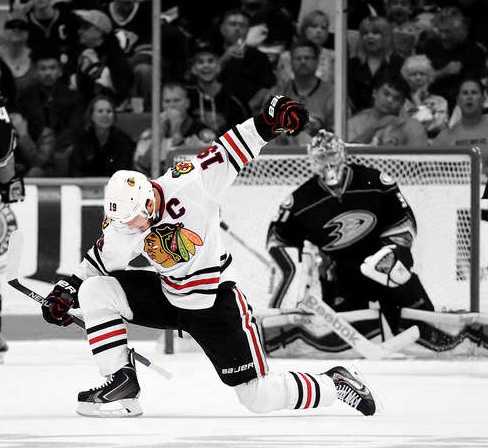 Keep in mind that the Hawks just knocked off Anaheim without Patrick Sharp scoring a single goal in the series. If he gets going now, look out. Stabilize Tampa’s top six. Nearly ALL of Tampa Bay’s scoring in these playoffs has come from their top two lines. The leading scorer on either of their bottom two lines, Ryan Callahan, has a grand total of just FOUR points this postseason. If the Blackhawks can take away some of the scoring from even just one of the Lightning’s top two lines, Tampa will be in trouble and their bottom six will be forced to produce. It’s hard to win the Stanley Cup while getting production from just two lines. Keep up the good D. Despite using basically four and a half defensemen against the Ducks, the Blackhawks’ blue liners still played a really solid series. Duncan Keith is playing out of this world right now and is looking like the planet’s best d-man yet again. Brent Seabrook has been just what he’s needed to be defensively this postseason, while also coming up with big goals along the way. Niklas Hjalmarsson keeps blocking shots and is arguably the Hawks’ best d-man in the defensive zone, which is saying something. Johnny Oduya is having an incredible postseason, which has allowed Quenneville to pair him up with Hjalmarsson and Seabrook at any point in time. As for the fifth and sixth d-men, it’s now Kyle Cumiskey and David Rundblad filling those slots. Kimmo Timonen and Michal Roszival started the playoffs as the Hawks’ last two defensemen, but have since been benched and injured respectively. Given Tampa’s lack of size and good speed, Kyle Cumiskey may very well see his role increase this series. He’s quick and likes playing a fast game. If David Rundblad can simply do what he did in games 6 and 7 against Anaheim, he’ll be fine. Win or play to a draw on special teams. The Blackhawks’ powerplay has been rather ineffective for much of these playoffs, despite getting a couple big goals in Game 7 against the Ducks. When given a man advantage in this series, the Hawks have got to at least generate chances and momentum, and preferably score. Too many times have they given their opponent momentum by getting nothing going on the powerplay. That can’t continue happening now. As for the penalty kill, the Blackhawks have gotten better in that area recently, but will be going up against a usually potent powerplay of the Lightning. Killing off penalties, as usual, will be key. If the Hawks can win or at least come out even in special teams against the Lightning, I like the Blackhawks’ chances due to their depth advantage at even strength. And the obvious one, Corey Crawford. If you don’t have good goaltending right now, you’ve got no shot. Crawford has been on this stage before, whereas Ben Bishop has not, and Crawford needs to play that way. By that, I mean he needs to play this series like he’s been here before. He has come up huge for the Hawks already on a handful of occasions this postseason, including a couple times against the Ducks (most notably games 2, 6, and 7). His .919 save percentage is just one point behind Bishop, but given where that number was at after the first round, Crawford has clearly turned his game around. As I said in my series prediction, Crawford’s rebound control has been phenomenal at times this postseason, including, yet again, games 2 and 7 against the Ducks. When he is absorbing the puck and not giving up rebounds, he is nearly unbeatable. If he can keep up his play in net, it’ll be on the guys in front of him to get the job done, and that’s a good thing. Something I didn’t mention above is that the Lightning love playing with speed going north and south. The Blackhawks are one of the best teams at defending that. If you go back and look at Game 7 against the Ducks, for example, Anaheim tried continuously to move the puck through the neutral zone with speed, only to run into a wall of defenders or have the puck stripped. Considering that playing with speed through the neutral zone and getting odd man rushes is such a huge part of Tampa’s offense, if the Hawks can slow them down in that regard, the Lightning could be in trouble. On the flip side, the Blackhawks also like playing with speed going north and south through the neutral zone. Anaheim, one of the league’s best defensive teams at the forward spot, had serious trouble stopping the Hawks from playing that way. Tampa Bay, who probably doesn’t have the caliber of defensive forwards that Anaheim does, will most likely also have trouble, and maybe more, stopping the Blackhawks from using their speed going up the ice with the puck. If the Hawks can be the ones to dictate the pace of play and use their north-south speed to their advantage, they’ll be in good shape. Another thing that I haven’t touched on is the experience factor. I’m sure some of you are now rolling your eyes and saying that this aspect of the game gets blown out of proportion. If you think that way, that’s perfectly fine. However, you cannot overlook the fact that the Blackhawks have been here twice in the last six years and walked away hoisting the Cup both times. This team knows better than any other team how to handle big games, pressure, and adversity. That type of experience pays big dividends, as evidenced by the way the Hawks blew out Anaheim in Game 7. I’m not saying the pressure will ultimately make Tampa Bay crumble, but it may wear on them more than it will the Hawks. Looking at this matchup on paper, which is all we can really do at this point, the Blackhawks have a decent advantage in my eyes. Yes Tampa is fast and probably faster than anyone the Hawks have faced, but their lack of depth and experience will prove to be too costly against a Hawks team that is loaded with forward depth and experience in this round. 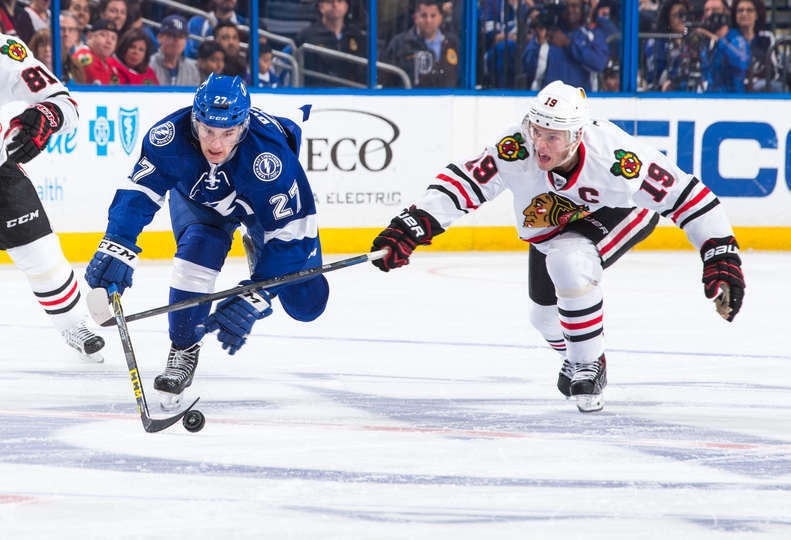 If the Blackhawks can take one of the first two games in Tampa Bay, it will put the Lightning under a lot of pressure to win one of the first two games in Chicago, where the Blackhawks are nearly unbeatable. Whether or not that pressure proves to be too much for this young and inexperienced Tampa team remains to be seen. I’m saying Blackhawks in six. After Saturday night’s rather dominating victory over the Ducks in Game 7 of the Western Conference Final, the Blackhawks had punched their ticket to their third Stanley Cup Final appearance in the last six years. No other team in hockey can say they’ve done that. Opposing the Blackhawks will be the Tampa Bay Lightning; a team many had picked to come out of the East well before this season ever began. If a hockey lover could have hand picked their dream Stanley Cup Final, this one may very well have been it. Both teams are highly skilled, fast, exciting, and dress big name players. There aren’t many other matchups that could consist of players such as Jonathan Toews, Patrick Kane, Marian Hossa, Duncan Keith, Steven Stamkos, Tyler Johnson, Ondrej Palat, and Victor Hedman, just to name a few. Just consider ourselves lucky that we get to witness such a star-studded final. Let’s start with the Blackhawks. The Hawks come into this year’s SCF after having knocked off the Predators, Wild, and Ducks in the first three rounds. One could argue that the Blackhawks have had to travel the tougher road up to this point, but that’s an argument not worth getting into at the moment. Up front, the Blackhawks own what many consider to be the deepest group of forwards in the NHL. Their top two lines are nearly unparalleled, and their third line often plays like another top two line. What eventually helped put the Blackhawks over the top against Anaheim was that they kept getting contributions from their bottom two lines. If you look at the seven games that were played in the WCF, the Hawks got continuous scoring and production from those bottom six forwards. Whether it was Marcus Kruger, Andrew Shaw, Antoine Vermette, or Teuvo Teravainen, those guys kept coming up with big plays and goals. The Ducks simply couldn’t match that. And now that Kane and Toews have been reunited on the top line, the Blackhawks offense has looked nearly unstoppable. Defensively, a lot has been made of the number of minutes that the Hawks’ top four d-men are playing. Clearly, however, that hasn’t fazed those guys one bit. Duncan Keith is coming off of one of his best ever playoff series, as is Johnny Oduya, and Brent Seabrook and Niklas Hjalmarsson just continue to be themselves and make the big plays offensively and defensively. Not many teams own as solid of a top four as the Blackhawks. Kyle Cumiskey and David Rundblad both played pretty well in games 6 and 7 against the Ducks, which is a good sign moving forward. In net, Corey Crawford is back to his 2013 form. He currently owns a .919 save percentage and has single handedly won the Blackhawks a couple of games this postseason. His rebound control has seemingly gotten better and better as these playoffs have progressed, and when he is absorbing the puck like he did in Game 7, for example, it’s tough to score on him. As for the Lightning, they were the best offensive team during the regular season, and they haven’t slowed down all that much in the playoffs. They have three players with at least 17 points this postseason, including Tyler Johnson who leads the playoffs with 21. His 12 goals are also a playoff best up to this point. Tampa Bay’s top two lines have been nearly unstoppable for long stretches during these playoffs, and if that continues, they’ll have a chance in this series. The problem with their forwards is their bottom six. Ryan Callahan leads them in points with just 4. To compare, Patrick Sharp leads the Blackhawks’ bottom six with 12. The Lightning absolutely must receive more from their bottom two lines if they want to succeed in this series. On the back end Tampa owns a pretty solid group of defensemen. Led by their top pairing of Victor Hedman and Anton Stralman, the Lightning have speed and defensive reliability with most of their d-men. Hedman, Stralman, and Nikita Nesterov all have recorded more points than any of Tampa’s bottom six forwards. This is a defensive group that likes to be active in the offensive zone and tends to take some chances when most wouldn’t anticipate them to. When you take into account their top two lines, the Lightning’s ability to also produce offense from the blue line makes their offense lethal at times. Between the pipes for Tampa Bay stands Ben Bishop and his 6’7″ frame. His .920 save percentage is one point higher than that of Corey Crawford. Bishop, while he has looked quite “leaky” at times (especially against New York), has also turned in some big time performances. He recorded shutouts in games 5 and 7 against the Rangers, with both of those games being played in New York. That should tell you that this guy doesn’t get easily rattled when under pressure to perform. This is going to be an extremely fast-paced series featuring two teams that like to play that way. The key to winning will come down to depth and special teams. On the one hand, Chicago has the definite advantage in the depth department. Their bottom two lines have been phenomenal this postseason, and Tampa’s have not. On the other hand, the Lightning have been the better team on both the powerplay and penalty kill thus far. Even though Tampa Bay has the better special teams (statistically), the Blackhawks are getting just enough production out of theirs to still be successful. Add in Chicago’s depth at forward and the entire team’s level of experience in the Stanley Cup Final, and it’s nearly impossible to pick against them. 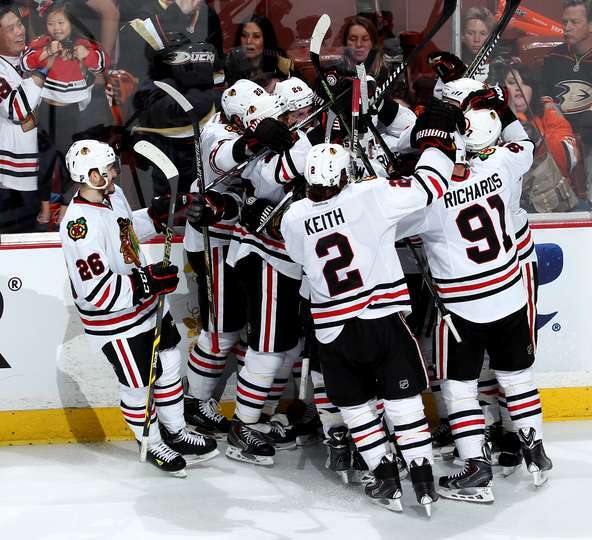 For the third straight postseason, the Blackhawks will be playing a Game 7 as they take on the Ducks tonight in Anaheim at 7:00pm CT. Two years ago, it was the Blackhawks defeating the Red Wings in overtime at the United Center to advance to the Western Conference Final. Last year, 363 days ago to be exact, the Kings sent the Hawks home in overtime, yet again, of Game 7 at the United Center. Joel Quenneville recently described that loss as “the worst of our lives.” Tonight, the Blackhawks have the chance to redeem themselves and earn a trip to the Stanley Cup Final for the third time in six seasons. This series between the Ducks and Hawks has been one for the ages. We’ve seen two multiple overtime games, one single overtime game, and three other relatively close games. Each team has one road victory and has proven that they are worthy of winning this series. Game 6 was a clinic by the Hawks. They didn’t come out guns blazing like Anaheim was expecting them to. Instead they seemed to sit back, wait for Anaheim to make a mistake, and then pounced. Once they finally “pounced” and scored the game’s first goal, they took their game to the next level and scored two more times within just a few minutes. They earned a 3-0 lead in the game (which was brought to 3-2 by the Ducks) and never looked back. Tonight, we need more of the same. Scoring first will be big yet again. It isn’t necessarily imperative, but it would sure be nice. Getting the game’s first goal will not only give the Hawks momentum, but it will put the Ducks on their heels and quiet the Anaheim crowd (not that they’re that loud anyways). The Blackhawks are a much better hockey team while playing with the lead than they are when playing catch up. Quenneville appears to be sticking with his nuclear line of Saad, Toews, and Kane to start the game. This line was rather dominant in Game 6, and there’s no reason why that should change tonight. The only difference now is that Bruce Boudreau and the Ducks will have the last change. Odds are that Boudreau will want Ryan Kesler matched up against the Toews line, which is something he wasn’t able to do very often in Game 6. Kesler was doing an okay job of defending Toews and his mates through the first five games, but with Kane now a part of that trio, it’s a new animal to try and handle. If this line gets off to a good start, things should be looking alright for the Hawks. The key to tonight’s game could lie with the Blackhawks’ second line of Bickell, Richards, and Hossa. This line had a difficult time getting much going last game (despite producing the Hawks’ second goal) and often found themselves pinned in their own end for long stretches of time. While Hossa is an elite two-way forward, Bickell and Richards are not. It will be key for these guys to put together good shifts and not get stuck playing defense the whole night. Odds are that they will probably see a lot of the Getzlaf-Perry line. As for the Hawks’ third and fourth lines, those guys continue to put pressure on Andersen and the Ducks’ defense with regularity. Those two lines have come up with a number of big goals in this series, and another one or two (or more) tonight wouldn’t hurt. Defensively, Duncan Keith will need to dig deep yet again and lead the way. His performance in Game 6 was one for the ages, and if he can do anything close to that again tonight, the Blackhawks will be in good shape. David Rundblad and Kyle Cumiskey both turned in good performances last game, and they’ll need to do so again tonight. Granted, Quenneville won’t be able to protect them as much as he could at home by giving them offensive zone starts all the time, but if these two can play solid games, then they’ll have done their job. In net, Corey Crawford now owns the best save percentage of any goalie to make the Conference Finals. He has turned in clutch performances in big playoff games before, and the Hawks will need him to do it again. Expect the Ducks to come out of the gates going 100 miles per hour tonight, meaning Crawford will have his work cut out for him. It is imperative that he makes some big time saves without letting in any soft goals. Most seventh games end up being rather low scoring as neither team wants to take too many chances that could lead to disasters going the other way. I’m not saying tonight will be the same, but don’t be surprised if it is. Anticipate seeing both teams play conservative games similar to what you see in overtime. I’ll be shocked if the Ducks try and play a super physical game tonight because that can lead to players being caught out of position. Their goal in being as physical as they were through the first six games was to wear the Blackhawks down for Game 7. Now that we’re at Game 7, the Ducks will probably ease off the physicality aspect of their game with the hopes that their hitting earlier in the series did it’s job (I doubt that it did). As I am writing this, my heart is already trying to escape my body, and we’re still an hour and a half from puck drop. Game 7’s, while they are the most entertaining games for fans, are the worst for fans of the two teams playing. It is literally three straight hours of feeling like you’re going to throw up. Luckily for us Blackhawks fans, we’ve become quite experienced in these types of huge games (as have the Hawks’ players) and know how to handle them better than most other fan bases. Given what this roster of Blackhawks players has gone through in past postseasons whether they’ve won or lost, I am confident that they will come out as the more prepared team tonight and deliver a victory. After winning a crazy Game 4 in double overtime to even this best of seven series at two games apiece, the Blackhawks will take the ice in Anaheim tonight in Game 5 looking to bring a 3-2 series lead back home for Wednesday. Both of the Blackhawks’ victories in this series have come in multiple overtime games, something this team has become accustomed to in recent years. 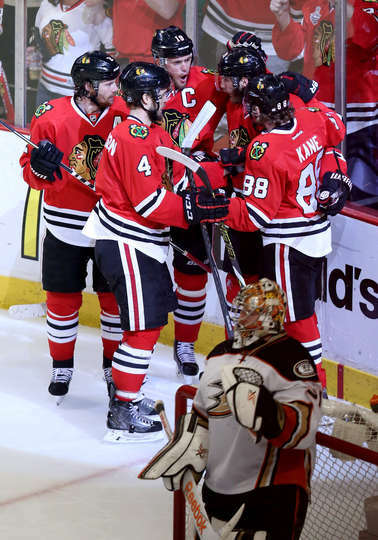 In fact, the Hawks are the first team in NHL history to win four multiple overtime games in one postseason. This is a resilient group that doesn’t seem to ever be fazed by adversity. After losing Game 2 of this series in triple overtime, many thought that the Ducks would be somewhat demoralized and surely lose Game 3. That did not happen as they went on to win that game by a score of 2-1. After losing Game 4 in double overtime, now their second multiple OT loss of the series, one has to wonder if Anaheim will be down on themselves heading into tonight’s game. Odds are that they’re not, but losing two games in this series in the fashion that they did is not easy to overcome. With the series now shifting back to California, however, one should assume that the Ducks have forgotten about Game 4. In this series, each team has had extended stretches in which they have controlled the game. Both sides are probably thinking that they’ve been the better team than the other. The truth of the matter is that these are two very evenly matched teams, and frankly, this series could go either way at this point. So heading into tonight’s fifth game, let’s take a look at five keys to a Blackhawks’ victory. Score first. The team that has scored the first goal in the game has won each game this series. That’s not to say this will continue, but playing from behind is much more difficult than playing while ahead. 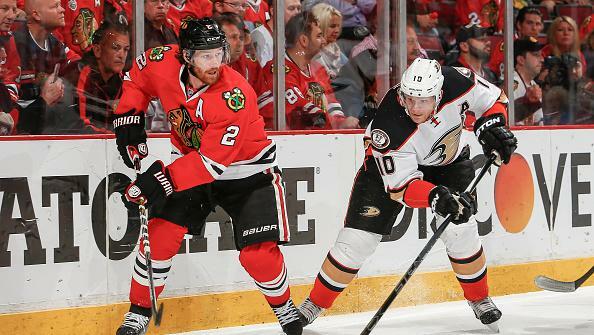 With this game being in Anaheim, the Blackhawks do not want the Ducks getting the first lead. Anaheim thrives on home ice while winning. Good special teams. The Blackhawks’ powerplay has been both good and bad this series. The two games in which they’ve notched a powerplay goal, they’ve won. Anaheim is a team that clearly likes to be physical and get involved in extra-curricular nonsense. Those two traits often lead to more penalties for them compared to their opponent. If the Ducks are going to continue taking bad penalties, the Blackhawks have to make them pay. Scoring at even strength against this team is no easy task, so taking advantage of being up a man will be big. Also, the Hawks’ penalty kill has been better during this series than either of the first two. It goes without saying that killing off their penalties is hugely important, especially at this stage of the series. If the Blackhawks can win the special teams play tonight, they should win the game. Continue rolling four lines. Arguably the biggest strength of the Blackhawks is the fact that they have four lines that can generate offense while being responsible defensively. After messing up his lines in Game 3 (a game in which the Hawks’ offense looked lost), Quenneville went back to his original lines from games 1 and 2 for Game 5. The result? Four lines that put heavy pressure on the Ducks’ defense and Frederik Andersen. The two overtime goals scored by the Hawks in this series have come from their fourth and third lines respectively. They need all four lines to continue doing what they’ve been doing. The Toews line seems to have picked up some momentum recently, and hopefully they can carry that into tonight. Get good minutes from the defensemen. So much has been made of the fact that the Hawks are really only using four d-men right now. While no one can deny that their top four defensemen are logging heavy minutes, I will say that those four guys are not as worn out as the media and Ducks players are making them sound. That being said, Keith, Seabrook, Hjalmarsson, and Oduya need to keep up their strong efforts. Getting productive minutes out of Cumiskey and Timonen will be key as well. Corey Crawford. He always seems to step up in big games and deliver. With so much at stake in this game, there’s no question that Anaheim will come out flying tonight, and Corey Crawford will need to make some big saves. We’ve seen him do it many times before, and he’ll need to do it again. The Ducks have done a lot of talking over the past couple days about how they know they’re wearing down the Blackhawks with their physical play. They’re doing so much talking about that subject that it almost seems like they’re doing whatever they can to make themselves feel good about where they’re at. I am really starting to wonder if they haven’t become distracted by the fact that the Hawks are taking so many hits without really showing any symptoms of being worn down. Also, I’ve never seen a team more concerned with trying to get in the heads of their opponent than the Ducks. Every single time Ryan Kesler is on the ice, he’s either chirping or doing something else towards a Blackhawk to try and get in their head. It’s almost as though he’s more worried about that than he is the actual game. The same can be said of Corey Perry. The Ducks are a team that tends to lose their cool when things aren’t going well (much like the Blues). If the Blackhawks get a late lead in this game tonight and are controlling the play, it’s definitely realistic to think Anaheim might start taking dumb penalties out of frustration. If this happens, the Hawks need to make them pay. This is a pivotal game and one that would be massive for the Hawks to win. As I’ve said many times, there isn’t another team in hockey more equipped to handle the pressure of and win big games. It ended up being the longest game in Chicago Blackhawks franchise history, and it will no doubt go down as one of the most memorable. 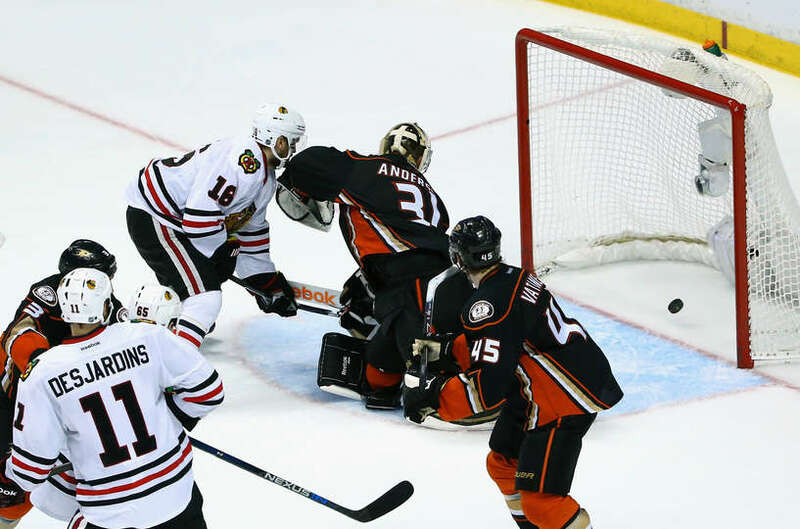 Game 2 of the Western Conference Final between the Ducks and Blackhawks started at roughly 8:20pm Central time on Tuesday, lasted nearly six whole periods, and finally ended around 1:15am Wednesday thanks to Marcus Kruger. A game that extends to a third overtime and finishes the day after it began would normally exhaust its viewers, with many of them opting to go to sleep instead. Not this game, however. From start to finish, Game 2 featured non-stop action and heart-stopping moments making it basically impossible to turn away from. After getting two quick powerplay goals to begin the first period, the Blackhawks saw their 2-0 lead evaporate by the end of the second frame. From the time that Marian Hossa knocked home the Hawks’ second goal all the way to the end of the second period, Anaheim pretty much dominated the game. They were hitting anything that moved wearing a white sweater and continuously pinned the Blackhawks in their defensive zone for long stretches. Fortunately, the Hawks got out of the first 40 minutes tied. The third period was a bit slower in pace with each team seemingly playing a more conservative game. Chances were had by each side, but both Frederik Andersen and Corey Crawford answered all shots directed their way. Overtime would ensue. 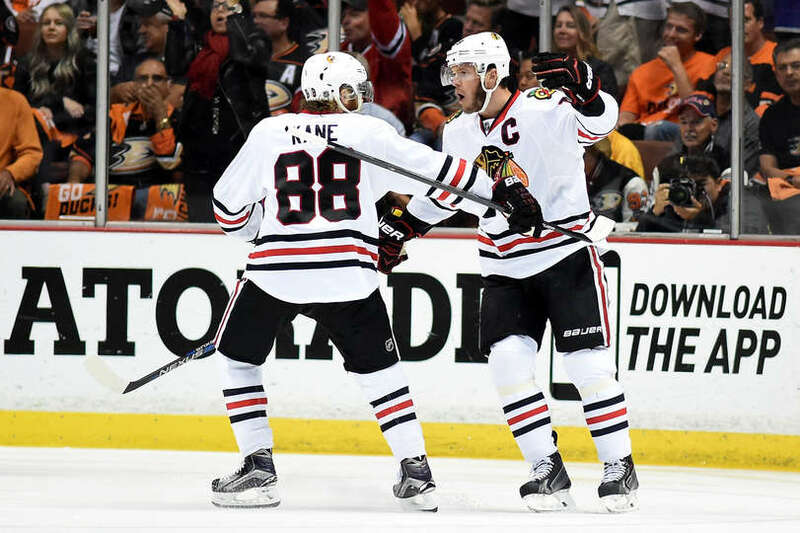 In the three overtimes that were played, both the Ducks and Blackhawks created numerous incredible scoring chances. Anaheim hit the post three, maybe even four times. The Hawks had a good three point-blank shots on goal. Each side was dealt a powerplay, but almost nothing was getting by the goalies. I say almost because the Blackhawks had a goal taken away from them during their powerplay in the second overtime period. After a shot from Patrick Kane deflected up high into the air off the shoulder of Andersen, Andrew Shaw proceeded to jump and headbutt the puck into the net. It was one of the most incredible things you will ever see in a hockey game, simply because it never happens. The Blackhawks players spilled off the bench and mobbed Shaw thinking that they had won the game, only to have the goal reviewed and overturned. By rule, intentionally hitting the puck into the net with anything other than your stick shall result in the goal being disallowed. Having said that, not many people including current and ex-players were fully aware that a “headbutt goal” is illegal. From there, the Ducks killed off the remainder of the Hawks’ powerplay and the game headed to a third overtime. In the third OT, both teams traded more chances only to be denied by the two netminders. Then finally, with 3:48 left on the clock, a point shot from Brent Seabrook hit Marcus Kruger to the right of Frederik Andersen, the puck dropped to the ice, and Kruger tapped it home for the game winner. Roughly five hours after the opening puck drop, the game was over. Due to the endless scoring chances and near-death moments for each team, this game was as exciting as they get and will go down in history as one of the greats. Corey Crawford was phenomenal. He had a couple of sequences in the overtime periods of two or three consecutive Grade A saves. In total, he stopped 60 of the 62 Anaheim shots. Those 60 saves are his new career high. Maybe no save was bigger or better than his glove save on Corey Perry with about eight minutes left in the second overtime. It won’t, but his Game 2 performance coupled with the way he played against Minnesota should silence any of his doubters. If he keeps this up, he and the Hawks will be a tough out. The Blackhawks top four defensemen all logged at least 46 minutes of ice time through the three overtimes, with Keith playing the most (49:51). To compare, Francois Beauchemin recorded the most minutes for the Ducks at 46:29. Analysts are already trying to make a huge deal out of this by saying that there’s no way the Hawks can survive with their top four d-men being asked to play so much each night while the bottom two defensemen receive much less time. While that may be true to a certain extent, if you look at the total minutes that the Blackhawks have played this postseason and then compare the total minutes played by their top four d-men, their average playing times are really not that abnormal. Keith, Seabrook, Hjalmarsson, and Oduya have been playing great, and they need that to continue. The bottom two lines for each team in this series have been great. All the talk has been about Anaheim’s third and fourth lines, but the Blackhawks’ bottom two lines have been just as good. The third line of Sharp, Vermette, and Teravainen was outstanding in Game 2 and generated the best scoring chances of any of the Hawks’ lines. That line also saw a lot of the Ryan Getzlaf/Corey Perry line and did a great job of keeping them in check. The fourth line of Desjardins, Kruger, and Shaw has arguably been the Blackhawks’ best line through these first two games and netted the overtime goal to take Game 2. Heading home, Joel Quenneville will now be able to decide which line plays against which of the Ducks, and this should only lead to added success for the Hawks’ forwards. Patrick Kane needs to be put into a position where he can be more dangerous. Being on a line with Bryan Bickell is not working for him. As the guys at The Committed Indian pointed out, it looks like Bickell could be hurt and is therefore not as effective while along the boards. Kane needs a guy on his line who can win board battles, maintain puck possession in the offensive end, and ultimately get him the puck. Switching Saad and Bickell may do the trick as Toews and Hossa could compensate for whatever Bickell is unable to do. The same can’t be said of Kane and Richards. Bottom line here is that Kane needs to be more involved offensively than he has been in either of the first two games of this series. Going along similar lines, the Blackhawks could use more production from the top line of Saad, Toews, and Hossa. With the series shifting to Chicago, Quenneville can now opt to get that line away from Ryan Kesler’s line which may lead to more offensive production. Having the last change at home is big, and even bigger when discussing a Joel Quenneville team. 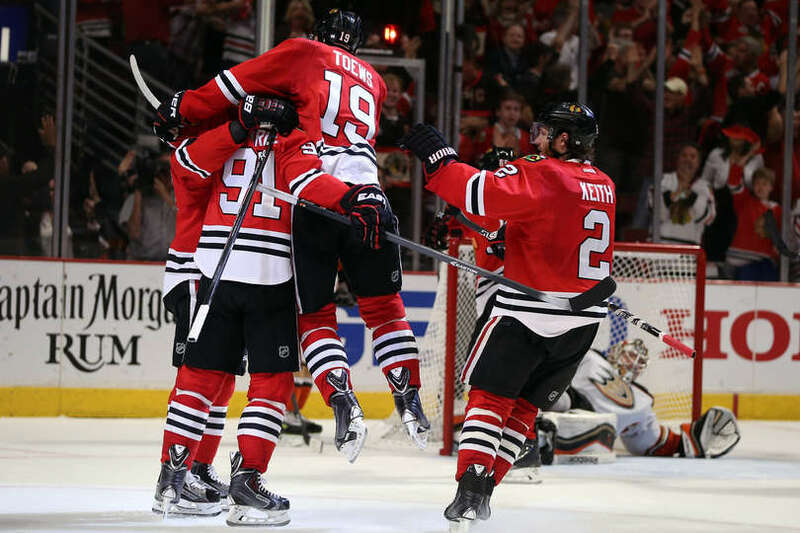 Lastly, the Blackhawks’ special teams showed up big time in Game 2. Their first two goals came via the poweplay, and their penalty kill was 5/5, including a big kill in overtime. Having said that, the Hawks did have an extended five on three in the third period and a five on four in overtime, but failed to score either time. Nonetheless, getting two powerplay goals and a perfect penalty kill is a welcomed sight for the Blackhawks. If they are starting to get the PK figured out again, that should only increase their chances of success moving forward. Taking the series back to Chicago tied 1-1 rather than down 2-0 is HUGE for the Blackhawks. They have played great hockey at home this postseason and are fully capable of winning the next two games. That being said, they are still going to be required to play some of their best hockey of the year if they want to beat the Ducks. Winning these next two won’t be easy, but it’s doable. Game 3 is Thursday night at 7:00pm Central time. A win would be huge for the Hawks, and that’s just what I expect. During today’s practice, Joel Quenneville had Kyle Cumiskey skating on the Blackhawks’ third defensive pairing with Johnny Oduya in place of David Rundblad. Rundblad made his playoff debut in Game 1, but it didn’t go so well for him as he was one the ice and partially responsible for two of the Ducks’ four goals. This lineup change shouldn’t come as much of a surprise to anyone who has followed the Blackhawks closely. Quenneville has been known to tweak his lineup when things aren’t going well. That’s not to say that things literally aren’t going well for the Hawks (they played a solid first game of the series), but David Rundblad had a tough time adjusting to the uptempo, playoff style of hockey in Game 1; his first career postseason game. Therefore he is being replaced. While this will also be Cumiskey’s first playoff game of the spring, there is reason to be a little optimistic about his presence in the lineup. What Cumiskey brings is speed. At five feet, eleven inches tall, he’s not the biggest or strongest guy on the ice, but he is one of the fastest. In a series like this against a quick team in Anaheim, the more speed on the back end, the better. One way to think of Cumiskey is by thinking of Nick Leddy. Remember him? Good. Nick Leddy is one of the fastest skating defenseman in the NHL. While with the Hawks, Leddy was a key component of the Blackhawks’ fast paced style of play. He would regularly carry the puck up the ice himself and get it into the offense zone where the forwards would take over. The Hawks have always been a better team when their d-men can be quick with the puck and skate it into the offensive end. I’m not saying that Kyle Cumiskey is another Nick Leddy, because he’s not. But if Cumiskey can be that extra speed on the back end that the Hawks have somewhat lacked this season, then that’s a good thing. Duncan Keith has been the fastest blue liner on the ice for the Hawks, and he’s really the only one who can and will carry the puck up the ice and into the offensive zone. If Cumiskey can provide at least a little bit of the same, that should only play into the hands of the style of hockey that the Blackhawks like the most. They are most effective while playing a fast, north-south brand of hockey. I guess the only big question with Cumiskey is his defensive responsibility. 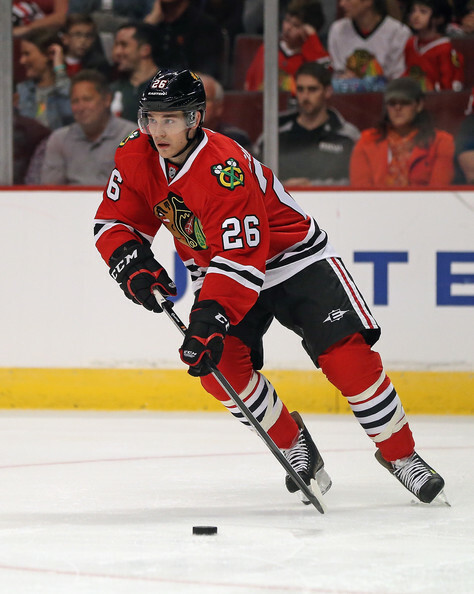 Can he be reliable in the Hawks’ defensive zone and not lose his man in front of the net or turn the puck over? Again, his quickness should only help him cover more ground in the Hawks’ own end, but his decision making will have to be on par. The problem with Rundblad that resulted in Cumiskey being inserted into the lineup is that Rundblad seems incapable of making quick decisions. He’ll hold the puck too long before passing, or he’ll decide to try and thread the needle with a pass instead of making the simple play and clearing the zone. While it looks right now as though the Hawks’ defensive pairings will be Keith-Hjalmarsson, Timonen-Seabrook, Oduya-Cumiskey, I wouldn’t expect those to stick. Quenneville has continuously switched up the d-pairings mid-game this postseason, and I see no reason why that would change now. Cumiskey should see more ice time than Rundblad, but whether or not that ends up happening remains to be seen. If he does, then the Blackhawks will be back to using basically five and a half defenseman like they were before the Rozsival injury. Game 2 is a big one for the Hawks. Coming home tied 1-1 in the series is much different than being down 2-0. Given how well the Blackhawks have played at home this postseason, heading home 1-1 could give them a big advantage.